Sync System Email Templates to all companies. Challenge / Problem: Maintaining email templates across multiple companies. Descritpion: Dynamics AX makes use of email templates for various bits of functionality in Dynamics AX, including workflow notifications and alert notifications. If you are using workflow in multiple companies and want to keep the same workflow template across the board, it can be quite frustrating to have to make the same changes in every company. The following script/job in X++ will help sync all (or some) system email templates and their respective languages into every company in Dynamics AX. Following up on my previous post on the use of Eventing for model management today’s post will demonstrate how to use eventing effectively on the validateWrite method of tables. This can be very useful for additional model specific data validation without overshadowing the original method. 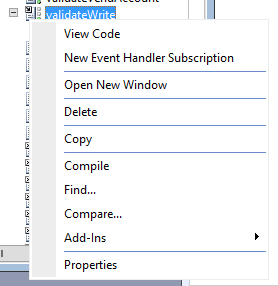 In this example I will use the validateWrite of the PurchReqLine table. 5. Add your logic to the method taking into account the current return value e.g. 7.2 Expand the methods section. You’re all done. Now test and enjoy. Please let me know if you have any comments or suggestions on the above. Keep an eye out some more samples like this in the next few days and weeks.